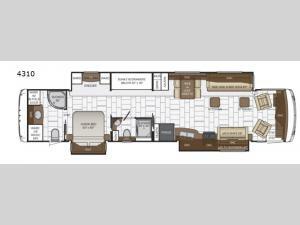 For added interior space you will love the full wall slide out in this 4310 class A Ventana motor home! Enjoy your meals at the free-standing table, and after dinner you can move to the 87" hide-a-bed sofa or the 58" fixed sofa to continue visiting with your family and friends. Your kids will enjoy the bunk beds and mom and dad can sleep at the queen bed in the master bedroom. This model also features two full bathrooms so now everyone can easily get ready for the day! This model is available with a Spartan chassis.